Two men have been arrested in the case of Jada, a Texas teen who experienced having pictures of herself after reportedly being sexually assaulted go viral on social media. In July, 16-year-old Jada was reportedly raped at a party, and pictures of her unconscious, naked body were posted to social media using the tag #jadapose. 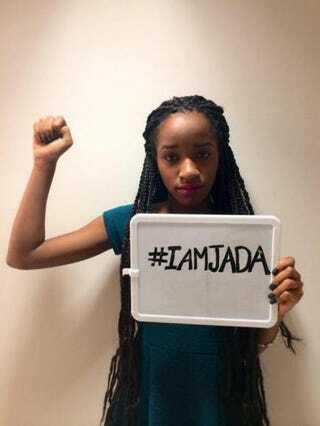 Supporters of Jada countered with the hashtag #IAmJada. MSNBC's Ronan Farrow is now reporting that two people—one adult and one minor—have been arrested in the case. In an interview with Farrow, Jada said, "I would like to see justice. Justice in full effect and that's it." When asked why it took so long for the arrests to happen, Jada’s legal counsel, Quanell X, said that there was a lot of evidence that Jada was not the only victim. He added that new investigators were put on the case. Jada told Farrow that she is still facing criticism from her classmates who took part in bullying her online. "From my community, there's very little support still, such as the teenagers, but as adults, they're very supportive. And people outside of my community are very supportive." When Farrow asked what she'd learned from going through such a public ordeal, she replied, "I learned that some people have hearts, and some people just go with what they hear."